A new Glasgow black cab has been unveiled that harnesses renewable energy to get hundreds of miles to the balloon. 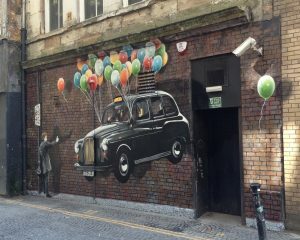 Our latest public art project sees some mighty fine spraying from Rogue-One bringing the world’s most eco friendly taxi to life. You’ll find it floating down Mitchell Street in Glasgow, at the Argyle Street end. Next project coming to a wall near you soon. If you live near that wall.